Diamond Valley Pro Video Slot Guide & Review - Casino Answers! Diamond Valley Pro is a 5-reel, 20-line video slot developed by Playtech, featuring a wild symbol, scatter wins, multipliers, a free spins feature and a bonus game. You can play the Diamond Valley Pro video slot at Bovada. Coin values on the Diamond Valley Pro slot machine are $0.01, $0.05, $0.10, $0.25, $0.50, $1, $2 and $5. You can select from 1-20 paylines. You can bet from 1-10 coins per line. The lowest bet you can make on the Diamond Valley Pro slot game is a penny per spin up to the highest total bet of $1000. With such a vast betting range, any type of slots player will enjoy Diamond Valley Pro – no matter if they are a casual player or high roller. To play the Diamond Valley Pro video slot, select your bet and hit the “Spin” button. To play Diamond Valley Pro with all 20 lines with 10 coins per line, press the “Bet Max” button. The highest paying symbol on the Diamond Valley Pro online slot game is the Tequila symbol. If you hit 5 Tequila symbols on a selected payline, you will win the 10,000 coin top jackpot. The Tequila symbol is wild and will substitute for all symbols except for the scatter and bonus symbols. Win lots on cash by hitting these jackpots on Diamond Valley Pro at Bovada! Diamond Valley Pro’s scatter symbol is the Vulture symbol. 2, 3, 4 or 5 Vulture symbols anywhere on the reels of Diamond Valley Pro will pay out 1X, 12X, 50X or 200X your total bet. After any win on the Diamond Valley Pro slot game, you can hit the “Gamble” button to activate the gamble feature. You can choose to double your winnings or double half of your winnings. Once you select your wager, you will have to beat the dealer’s card with a choice of one of four cards. You can gamble your winnings up to the gamble limit, which depends on the casino you are playing at. You can exit the gamble feature at any time by hitting the “Collect” button. Diamond Valley Pro looks great, sounds awesome, has a great top payout and a decent enough bonus game that doubles as a free spins feature. You can play Diamond Valley Pro along with the original Diamond Valley progressive jackpot slot when you sign up and make a deposit at Bovada! Can players from the United States play the Diamond Valley Pro slot game? 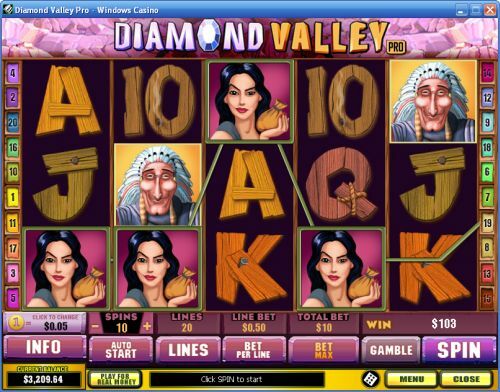 Unfortunately, Americans cannot play the Diamond Valley Pro video slot for real money. However, Americans are welcome to play the Super Diamond Mine video slot at Bovada. Is there a progressive jackpot on the Diamond Valley Pro casino game? No, there is no progressive jackpot on the Diamond Valley Pro video slot. You are looking for the regular Diamond Valley progressive jackpot video slot that you can also play at Playtech casinos like Bovada. ﻿In 1809, Wizard won the first 2,000 Guineas. In 2003, Alan Goehring won the first WPT Championship.